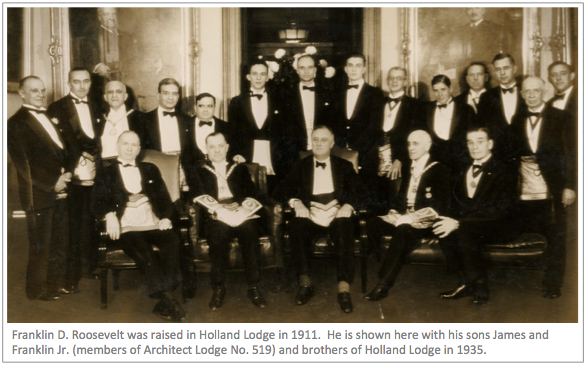 On May 30, 1787, a group of eight Masons of Dutch descent living in New York City petitioned the Grand Lodge of the State of New York for permission to establish a new Masonic lodge that would conduct its proceedings in the Low Dutch language. After some negotiations and after conceding that minutes would be maintained in English for the benefit of Grand Lodge inspectors, a Warrant to confer the degrees of Entered Apprentice, Fellowcraft, Master Mason and Mark Master Mason was issued to The Holland Lodge on September 20, 1787. Holland Lodge was, in fact, the first “new” Lodge to be warranted by the newly formed Grand Lodge of the State of New York in the wake of the American Revolution. Interestingly, the lodges existing in New York State at the beginning of the Revolution were “back-dated” to their original colonial warrants granted under the aegis of the two English Grand Lodges then in existence. Holland Lodge was formally consecrated in ceremonies held on October 1, 1787, and selected as its motto Deugd Zy Uw Cieraad, “Virtue Is Your Jewel.” The Grand Lodge first issued lodge numbers in 1789, and Holland Lodge was then assigned No. 8. The first candidate, Rudolph Henry Van Dorsten, the Secretary of the Minister of the United Netherlands to the United States, was duly initiated in the fall of 1787. From its very beginnings, Holland Lodge has had a distinguished membership, including an honorary membership conferred in 1789 on President George Washington, while the nation’s capital was in New York City. 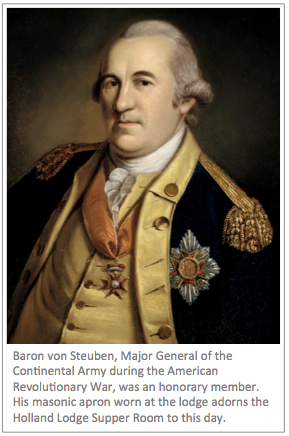 Distinguished members in the formative years included honorary members Baron Von Steuben, the Revolutionary War General, the Marquis de Lafayette in 1788 and Samuel Fraunces, the famous tavern keeper, who joined Holland Lodge in 1789 just prior to his service as steward to President Washington. 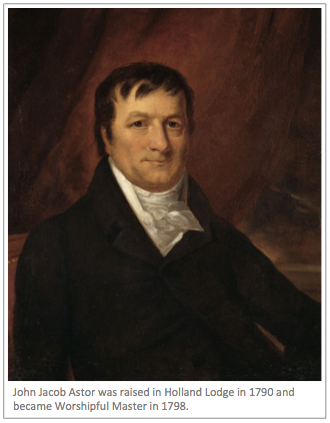 Other notable early members included German-born John Jacob Astor, raised in 1790 at the age of 27. In addition, the future New York City Mayor and New York State Governor Dewitt Clinton, was also raised in 1790 at age 21, while serving as private secretary to his uncle George Clinton, Governor of New York. Dewitt Clinton went on to have as distinguished a career in Masonry as he did in public office, rising to become Grand Master of Masons in the State of New York among other high offices in related bodies. Although Holland Lodge was founded to perform ritual work in the Dutch language, by the end of the eighteenth century English had largely taken the place of Dutch in the ritual of Holland Lodge as it grew to include a broader cross section of New Yorkers. To preserve the connection with our Dutch origins, however, the Lodge adopted the color orange for regalia and trappings on April 18, 1800, a custom it maintains to the present day, unique in New York Masonry. Through the early 19th century, Holland Lodge maintained its prominent status. The membership of the period included such luminaries as renowned explorer Commodore Matthew C. Perry, railroad entrepreneur Edward H. Harriman, and Franklin D. Roosevelt, who was raised in Holland Lodge in 1911.